Lee-Ann Brookes didn’t want to just get skinny. The Gain: As a teen, Brookes kept trim by walking to and from school and playing volleyball and baseball. 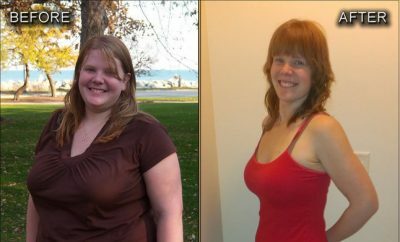 But when she went to college, she began putting on pounds: Between classes and studying, she never had time for exercise. Weekend drinks with friends and late-night pizza runs sent her weight soaring to 170 pounds. The Life: The next week, Brookes hit the gym and began cycling and walking 40 minutes a day, 3 days a week. She also rethought her food choices. Never a believer in dieting, Brookes didn’t count calories; instead, she focused on eating more vegetables and watching her portions. 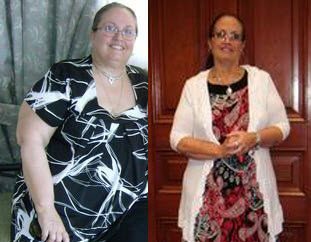 By the time she went home for Christmas 3 months later, she was down to 145. 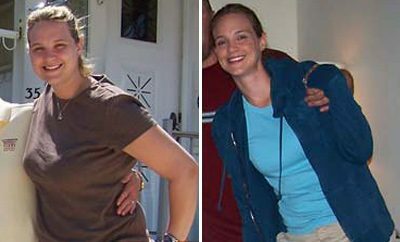 Adding weightlifting to her workouts helped her lose the last 25 pounds. The Reward: When she graduated that May, Brookes was a svelte 120. Since then, she has shifted her fitness focus to toning and gained 5 pounds of muscle. “My goal was always to be fit, not skinny,” she says. To celebrate her new body, Brookes got a belly button ring and bought a bikini to wear on her honeymoon last year.